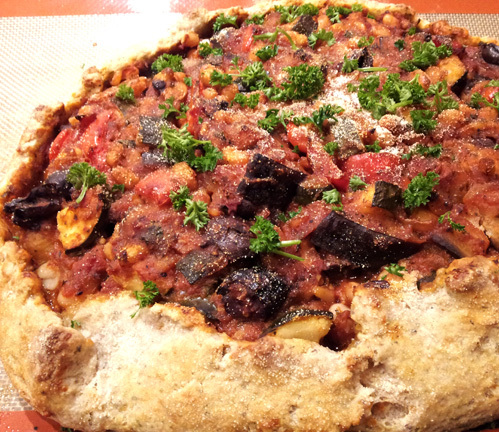 Rustic Italian Veggie Pie | Have YOU Ben Starr Struck? I saw a picture of something like this in a vegetarian cookbook, and since my household is temporarily vegetarian while my veggie friend is visiting from Brasil, I decided to make my own version. This is a pretty easy dinner, very hearty, sort of like a calzone. You could really use a variety of ingredients depending on whatever is available seasonally. Stir until no more dry ingredients are visible. Turn out onto a lightly floured surface and knead gently for a few strokes until it comes together into a soft, smooth dough. Wrap in plastic wrap and put in the fridge. Stir occasionally for a few minutes, then taste and correct seasonings. The filling should be a bit dry, if it’s very wet, continue cooking on high temp, stirring constantly, until enough water has evaporated to thicken it. Don’t overcook it or the whole thing will turn to mush. Remove the dough from the fridge and roll out to 1/2″ thick. Carefully transfer the circle of dough to a large cookie sheet lined with foil, parchment, or a silpat. (I fold the circle in half, then in half again, then transfer and gently unfold.) Scoop the filling into the center of the dough, leaving a decent margin of bare dough around the edges. You will probably have too much filling…save the rest to top pasta or to fill omelets. Gently fold the dough up around the filling to form a lip. Bake on the center rack of a preheated 425F oven for 30 minutes. Let it sit for 10 minutes before trying to slice. This entry was posted in Main Courses, Recipes, Vegetarian and tagged Italian, vegetarian. Bookmark the permalink.